From modest beginnings as a tea shop in New York, the Great Atlantic & Pacific Tea Company became the largest retailer in the world. It was a juggernaut, the first retailer to sell 1 billion dollars in goods, the owner of nearly sixteen thousand stores and dozens of factories and warehouses. But its explosive growth made it a mortal threat to hundreds of thousands of mom-and-pop grocery stores. This is the story of a stunningly successful company that forever changed how Americans shop and what Americanseat. ""More business books should be so gripping." 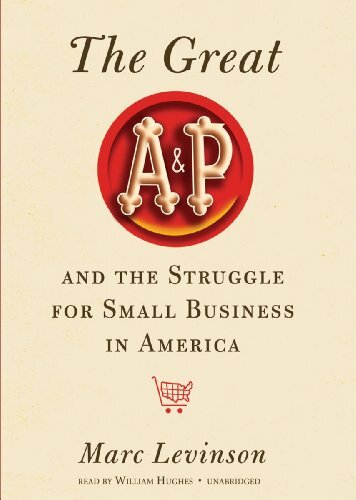 ""Marc Levinson's book "The Great A&P and the Struggle for Small Business in America "is a fascinating case story of one of twentieth-century America's largest and""most successful corporations. Levinson's manuscript not only illuminates an important""company and the men who ran it, but also documents the dramatic changes that""occurred in one of America's most significant yet academically neglected industries--retailing. The story at its core is one of creative destruction." --"The Journal of Economic History""
""[T]his is more than an economic story. It is a human story about a family that dedicated itself to making its business the best it could be--and how the death of the last member of that family was followed by A&P's decline into oblivion." [H]ighly accessible business history . . . Levinson has produced a valuable book . . . As a former editor for "The Economist," furthermore, Levinson is particularly effective at translating challenging economic concepts into language that lay audiences . . . can grasp. "Levinson makes it read like a novel . . . A great study of responding to the need to adapt to market and economic pressures to survive." ""Levinson has written a fascinating book on a critical chapter in American history that speaks directly to us today." "This is the kind of masterful business narrative that explains both the past and the present in an illuminating new light. Marc Levinson's highly insightful story of A&P--and its opponents--is essential reading for all those who seek to understand the love-hate relationship Americans have with the oversized consumer economy of our own day." ""What a splendid book! The rise and fall of A&P provides a rare window into the American experience--not just the creation of the world's largest retailer but the transformation of a nation dominated by small shops and local merchants into one of massive chains, well-known brands, and aggressive discounters. "The Great A&P and the Struggle for Small Business in America "shows that even the largest corporate goliaths are not immune to the insistent forces of competition and change. No one could have told this riveting tale better than Levinson--a historian, journalist, and economist--whose crisp and compelling writing makes the narrative's rich detail always run smoothly." ""A classic tale of trial and error, and of creative destruction." ""A marvelous read for anyone who cares about how the interconnected world economy came to be." Mr. Levinson has written an absorbing history of one company s amazing rise and what such success means in a nation with conflicting ideals about big business. It is more than a rich business history; it is a mirror to our own conflicting wants and visions of who and what we should be "The New York Times"
More business books should be so gripping. "The Wall Street Journal"
Levinson, who has burrowed deep in the archives, makes this story clear and compelling-and shows why A&P was both a boon to consumers and, in the words of an FDR-era federal prosecutor, 'a gigantic blood sucker.' Shades of Walmart? "The Atlantic"
Marc Levinson's book "The Great A&P and the Struggle for Small Business in America "is a fascinating case story of one of twentieth-century America's largest and most successful corporations. Levinson's manuscript not only illuminates an important company and the men who ran it, but also documents the dramatic changes that occurred in one of America's most significant yet academically neglected industries--retailing. The story at its core is one of creative destruction. "The Journal of Economic History"
[T]his is more than an economic story. It is a human story about a family that dedicated itself to making its business the best it could be--and how the death of the last member of that family was followed by A&P's decline into oblivion. "Thomas Sowell"
[H]ighly accessible business history . . . Levinson has produced a valuable book . . . As a former editor for "The Economist," furthermore, Levinson is particularly effective at translating challenging economic concepts into language that lay audiences . . . can grasp. "The Journal of Economic Literature"
[A] superb business study and an entertaining read. "The Courier-Journal (Louisville, KY)"
The fleeting nature of success in business--even for companies that revolutionized their sectors--is among the many useful lessons of this book. A&P's legacy is apparent every time we set food in a modern grocery store, even if the company itself long ago fell victim to many of the forces it unleashed. "The News Tribune (Tacoma, WA)"
Levinson makes it read like a novel . . . A great study of responding to the need to adapt to market and economic pressures to survive. "Booklist"
Levinson has written a fascinating book on a critical chapter in American history that speaks directly to us today. "BeyondChron (San Francisco's Alternative Online Daily)"
This is the kind of masterful business narrative that explains both the past and the present in an illuminating new light. Marc Levinson's highly insightful story of A&P--and its opponents--is essential reading for all those who seek to understand the love-hate relationship Americans have with the oversized consumer economy of our own day. "Nelson Lichtenstein, author of The Retail Revolution: How Wal-Mart Created a Brave New World of Business"
What a splendid book! The rise and fall of A&P provides a rare window into the American experience--not just the creation of the world's largest retailer but the transformation of a nation dominated by small shops and local merchants into one of massive chains, well-known brands, and aggressive discounters. "The Great A&P and the Struggle for Small Business in America "shows that even the largest corporate goliaths are not immune to the insistent forces of competition and change. No one could have told this riveting tale better than Levinson--a historian, journalist, and economist--whose crisp and compelling writing makes the narrative's rich detail always run smoothly. "Robert J. Samuelson, columnist for Newsweek and The Washington Post""